Since taking office less than a year ago, President Donald Trump has created the most corrupt administration in modern American history. He has used his position to enrich himself and his family, filled his administration with former industry lobbyists, and sought to prevent an investigation into his shady business practices. The American people have noticed. Not only do most Americans believe President Trump has broken his promise to combat corruption, they also view the Trump administration as the most corrupt government institution in the United States. The corruption is broader than just the President and his family. President Trump has assembled the wealthiest and least experienced Cabinet in recent memory. Unsurprisingly, the president’s senior leadership has taken cues from their boss: While arguing for devastating cuts to services that millions of Americans depend on, several Cabinet members have engaged in extravagant—and at times legally questionable—spending on themselves at the taxpayer’s expense. Public service requires a respect for and responsible stewardship of public resources. 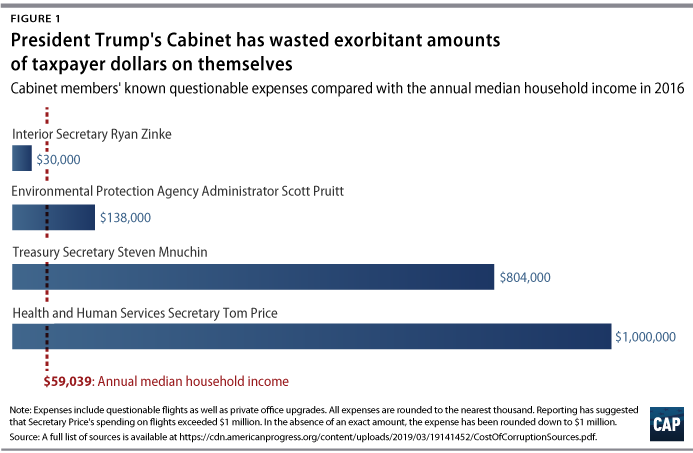 But, based on public information to date, the Cabinet has spent nearly $2 million on questionable flights and private office upgrades. For scale, these expenditures are more than 33 times what the average American family earned in 2016. President Trump has a long history of corruption that stems back to his shady business dealings in real estate and casinos, among other areas. While many of the details remain unknown due to the opaque structure of his businesses and his refusal to release his tax returns, the presidential campaign did draw attention to the egregious example of Trump University. Just after winning the election, then-President-elect Trump paid a $25 million settlement to resolve claims that he had defrauded students out of tens of thousands of dollars. President Trump’s campaign proved to be more of the same. Not only did then-candidate Trump use the campaign to funnel millions of dollars into his own companies, his top advisers also sought to secretly profit from it. For example, Jared Kushner, the president’s son-in-law and current senior policy adviser, pursued a business deal with a Chinese company that has questionable ties to the Chinese government in order to help his struggling real estate business. Michael Flynn, a potential vice presidential nominee and major Trump surrogate, accepted more than $500,000 to work as an agent of the Turkish government. Campaign Chairman Paul Manafort offered a secret briefing on the campaign to a Kremlin-aligned Russian billionaire he owed millions of dollars, as well as asked his staff how he could use his new position “to get whole” with former business associates. After the election, it quickly became clear that the culture of corruption fostered by candidate Trump would persist and grow under President Trump. In a departure from the practice of former presidents Barack Obama and George W. Bush, President Trump announced he would accept millions of dollars from corporations and wealthy donors for his inauguration. Nearly a year later, much of the unspent money remains unaccounted for. 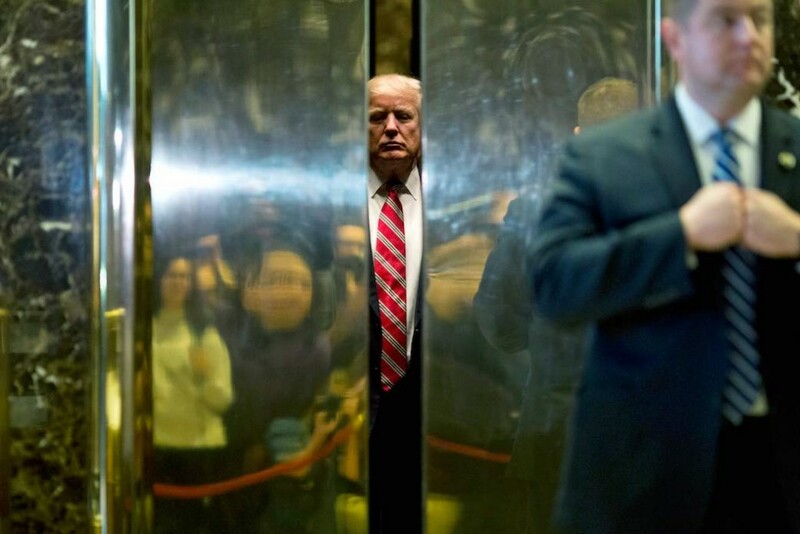 He refuses to divest from his business holdings, creating unparalleled conflicts of interest and leading to a number of suits arguing he is violating the Constitution’s anti-corruption clause. He frequently travels to his own properties and profits from the cost of government officials’ stays. For example, taxpayers were charged more than $1,000 for an official’s two-night stay at President Trump’s Mar-a-Lago club. He has held expensive political fundraisers at the Trump International Hotel in Washington, D.C., which has become a hotspot for foreign dignitaries and special-interest lobbyists seeking to curry favor with the president. And these are only a few of the extensive conflicts of interest created by President Trump’s intertwining of his businesses and public responsibilities. President Trump’s behavior has fostered a culture of corruption throughout the government. He has hired scores of former lobbyists to positions overseeing the very industries for which they previously worked. At least 44 top officials have connections to the Koch brothers and their political groups alone. Congress has followed the president’s example, passing a hugely unpopular tax bill that was a windfall for their wealthy donors and corporations. Not only did some congressional Republicans acknowledge that the bill was intended to satisfy their donors, but Congress even made last-minute changes that significantly benefit President Trump and the senators who then voted for the bill. Members of President Trump’s Cabinet—comprised of senior leadership at major federal agencies and other top advisers—have spent taxpayer money on themselves with abandon. Expenses have included flights on private planes and costly office upgrades and have led to numerous investigations by agency watchdogs. While many of these expenses may not violate federal rules and the use of military or chartered planes may be necessary in some circumstances, the sheer number of questionable expenditures shows a lack of respect for public funds. Cabinet members spent a grand total of nearly $2 million on wasteful or legally questionable expenses. And these are just the ones that are known; given the incredible secrecy of this administration’s Cabinet, it has been difficult to determine exactly how it spends public dollars. Perhaps the most notable example of exorbitant spending is former Secretary of Health and Human Services Tom Price, who investigative reporters found had spent more than $1 million on chartered and military flights over several months. Domestically, Secretary Price flew by private plane at least 26 times, including on a trip that took him to a Georgia resort where he owned property and a lightly scheduled trip to Tennessee where he had lunch with his son. Secretary Price eventually offered to reimburse the government slightly less than $52,000, or only a fraction of what he spent. Regardless, the political fallout from the scandal forced him to resign from his position in late September. Secretary Price is far from the only one spending exorbitantly. Environmental Protection Agency (EPA) Administrator Scott Pruitt has raised concerns by taking a number of chartered flights that cost taxpayers more than $58,000. In addition to those flights, he has raised questions with an international trip to Morocco to promote the use of fossil fuels—a subject unrelated to the EPA’s mission—for which Pruitt spent nearly $40,000. And it is not only the cost of his travels that has raised issues, but also their frequency. He spent almost half of his first three months in the job traveling to or from his home state of Oklahoma, costing taxpayers more than $15,000. Given the administrator’s well-known political aspirations, there is concern his frequent travel to Oklahoma is his way of garnering support should he run for office. In response to these concerns, the EPA inspector general has opened an investigation into the trips. Beyond his travel, Pruitt also spent nearly $25,000 to create a so-called privacy booth in his office, which former EPA officials called “bizarre” and a “headscratcher.” Furthermore, he sought to award a $120,000 no-bid contract to a Republican opposition research firm to shape press coverage of the EPA. The firm decided to withdraw from that contract after it was revealed that one of its top executives had been secretly investigating EPA employees for signs of bias against the Trump administration. Secretary of the Interior Ryan Zinke has also come under fire for his excessive travel costs. He has taken a number of questionable flights, including a $12,375 flight from Las Vegas to near his home in Montana before speaking at the Western Governors’ Association the following day. Secretary Zinke said he was in Las Vegas to announce a routine local funding grant in a small rural town outside the city, but while he was there, he also spoke to a hockey team whose owner helped raise nearly $200,000 for his earlier congressional campaigns. Additionally, Secretary Zinke spent more than $14,000 on government helicopter flights, including a flight back to Washington to go horseback riding with Vice President Mike Pence. These various flights cost taxpayers nearly $30,000. In his investigation of the secretary’s flights, the inspector general determined that, because Secretary Zinke failed to properly document his travel, there was no way to determine if he had violated government rules. Secretary of the Treasury Steven Mnuchin has made a habit of taking military planes at government expense. Since taking office, he has spent more than $800,000 on these flights, costing taxpayers approximately $780,000 more than if he simply flew coach, as former Treasury Secretary Tim Geithner frequently did. Secretary Mnuchin also asked for a military plane for his honeymoon in Europe but subsequently withdrew the request after facing media scrutiny. The inspector general investigated these trips but, because they were all approved by the White House, concluded there was no violation of law. The report, however, noted that very little information was provided to justify these trips. Given its breadth, combatting President Trump’s culture of corruption requires changes throughout government. Detailing all such changes is a project that is both necessary and beyond the scope of this column. However, there are several policies that deserve consideration in the ongoing discussion. First, the president and vice president should be subject to more extensive financial disclosures, including requiring both to disclose their tax returns—a longstanding precedent that President Trump has so far flouted. Steps could also be taken to increase personal financial disclosures from high-ranking White House and Cabinet officials as well as to increase the independence and authority of the Office of Government Ethics, which oversees the ethics program for the executive branch. Second, more needs to be done to reduce the influence of corporations and wealthy donors in Congress. For example, as CAP recently proposed, members of Congress should not be allowed to accept contributions from the corporations and special interests that their committees oversee. Lobbyists should not be allowed to fundraise or bundle for election campaigns, and members of Congress should have a lifetime ban on profiting from their time in public service by becoming for-profit lobbyists. Lastly, to address the distortions in the political process as a whole, we need a system that is more responsive to the voters—not just the wealthiest few. That requires more effective campaign finance disclosures and closing dark-money loopholes. An even more significant step would be to have citizen-funded elections by matching small donor contributions. No one proposal is a panacea, but by approaching the problem from a number of angles, true progress can be made. For starters, we must realize that there is a problem: The current administration’s corruption is unprecedented and deeply problematic, and we need to take real steps to combat it. Sam Berger is the senior policy adviser at the Center for American Progress. Gwen Calais-Haase is the special assistant for Democracy and Government Reform at the Center. *Author’s note: To calculate the number of seniors who could be served through the Meals on Wheels program, the authors used Mathematic Policy Research’s estimate of an annual per person cost of $2,765 for 250 days of meal deliveries. To calculate the cost of public school, the authors used the $12,509 per pupil cost calculated by the National Center for Education Statistics. To calculate the number of meals that could be provided through nutritional assistance, the authors used the Center on Budget and Policy Priorities’ estimate of $1.39 per meal. To calculate the number of people who could be provided Medicaid, the authors used the Kaiser Family Foundation’s cost estimate of $5,376 per person.